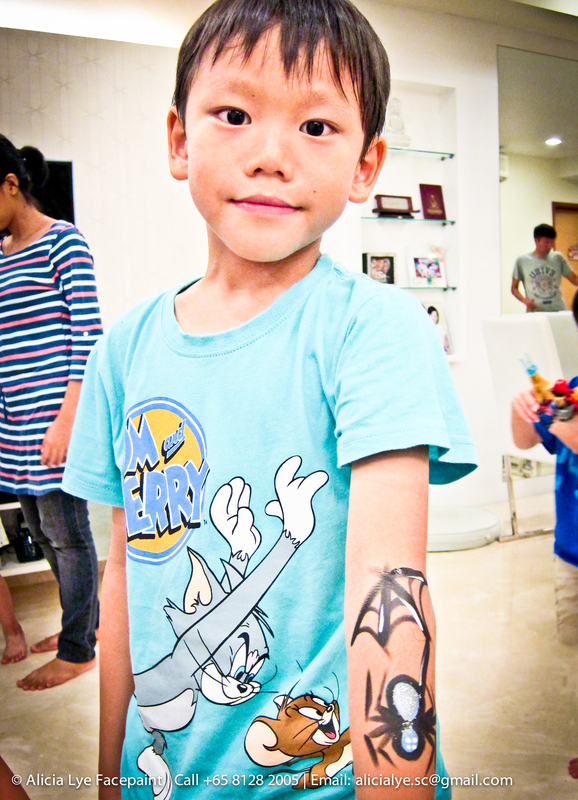 Face Painter @ Tyler’s Birthday Party | I Paint and Twist Anything! Happy birthday Tyler! 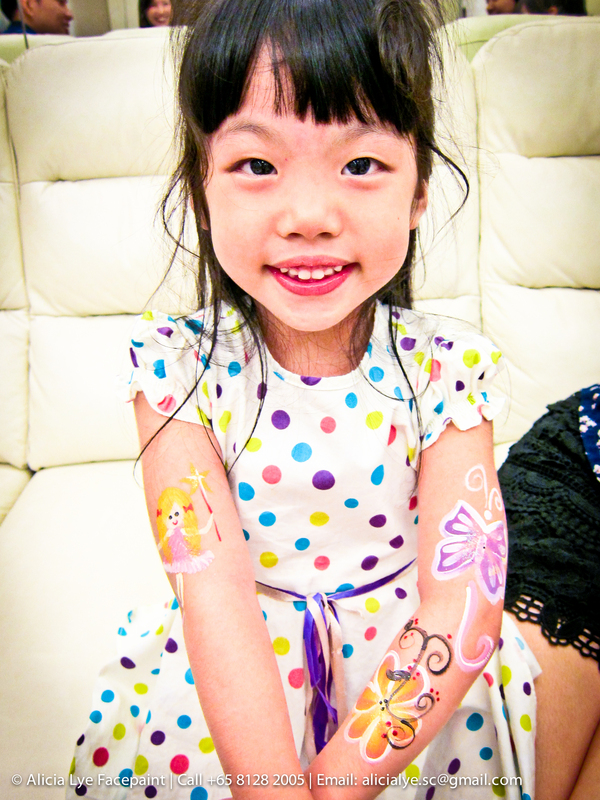 Thanks to pretty mommy Aileen, all her kids had their faces and arms painted and tattooed at the party! 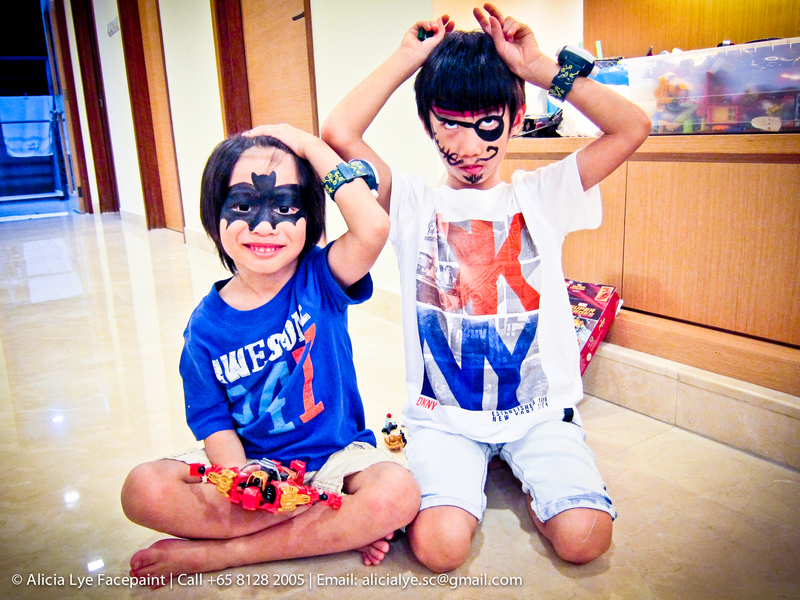 Aren’t both brothers cute? 😀 They’re so fun to face paint! Especially Mr Pirate! You should have seen the expressions he made when he first saw himself in the mirror. He went, “YAAAAAAaaaaa!! !” And ran one round through the backyard and back around the house. LOL. Cute like anything. 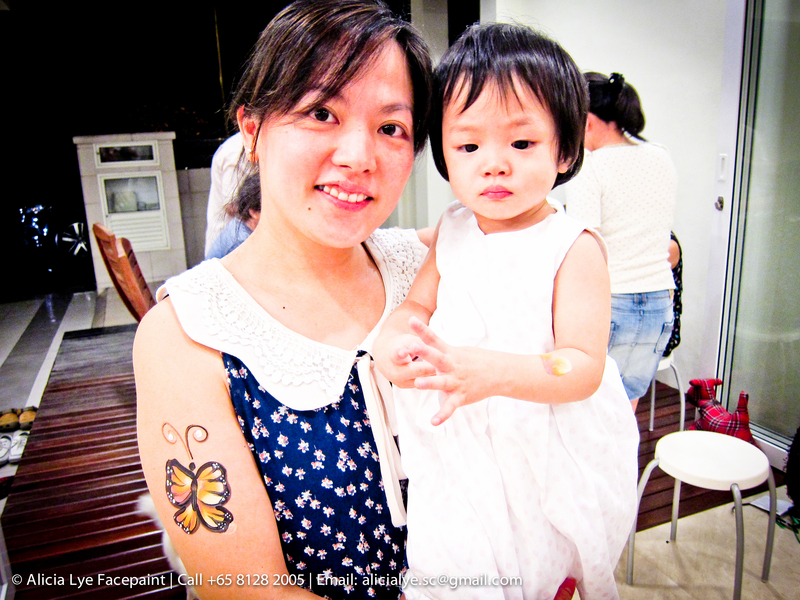 A very spontaneous Mom decided she’d get a butterfly on her arm to set a “good example” to Baby. I tried to paint Baby too but she was so scared! I felt a little like a monster trying to put cold slobbery paint on her but Mom really wanted her to get some paint. Guess it’s good training for Baby to be exposed to different people and unique experiences too especially when they eventually have to go to for checkups at the Doctor and stuff.. But just so I didn’t terrify her too much, I sang her some praises and did a quick dabble of colors for a simple heart & glitters using my spongey. She’s so good! Brave girl. This is my loyal customer for the evening. She kept coming back for one more, and one more and one more. Hahahaha! Isn’t it every girl’s dream to have a princess fairy in a pretty fluffy dress? 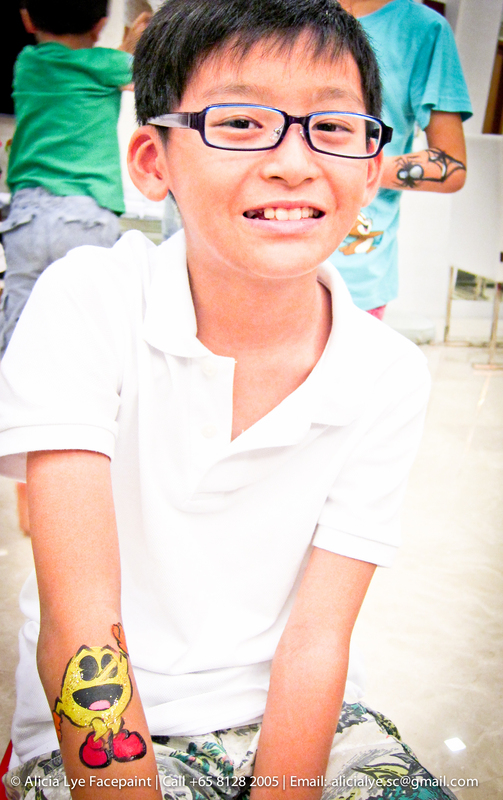 After some coaxing from Grandpa, he finally decided to come forward to get a creepy crawly spider on his arm! I would like to do this on someone’s face during my next face painting event! My next happy customer was a delight! He brought back the retro Pacmac! I always love painting novel designs for kids! So much more fun to let everyone have something unique to show off to each other. Like, “Look at mine! Pacman!!! You?? Batman! !” Hahahaha. My loyal customer’s little sister. She wanted everything than Da Jie got. 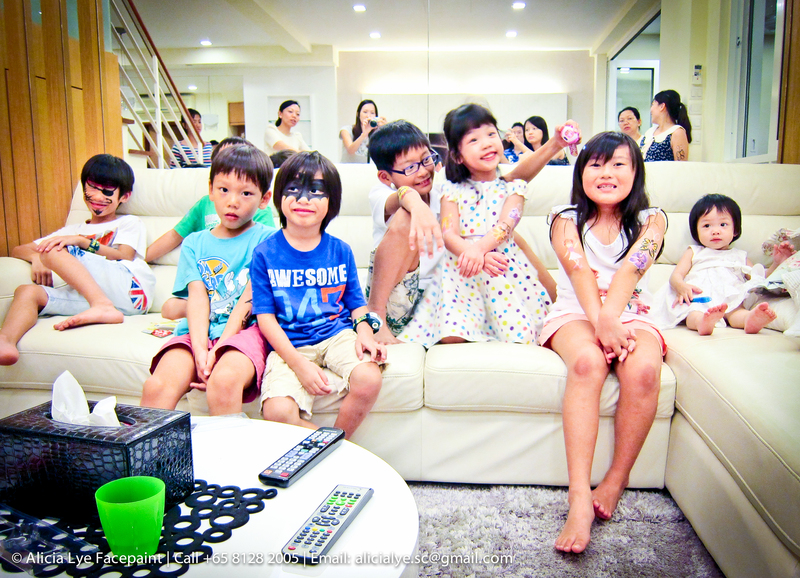 Doesn’t this remind us of our own younger sibling(s) when we were small? 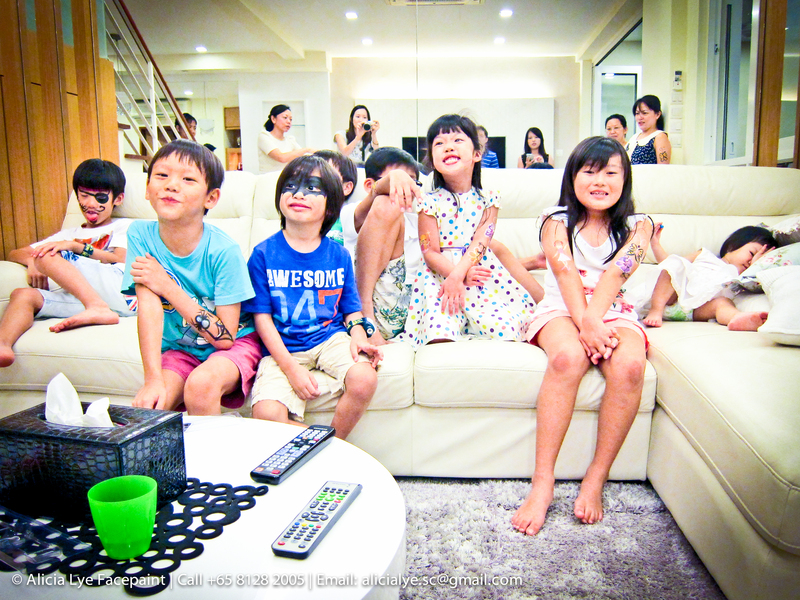 Time for group photo shoot on the couch! Look at the way the girls were squeezing their arms together like Marilyn Monroe? No, they are not seducing you. 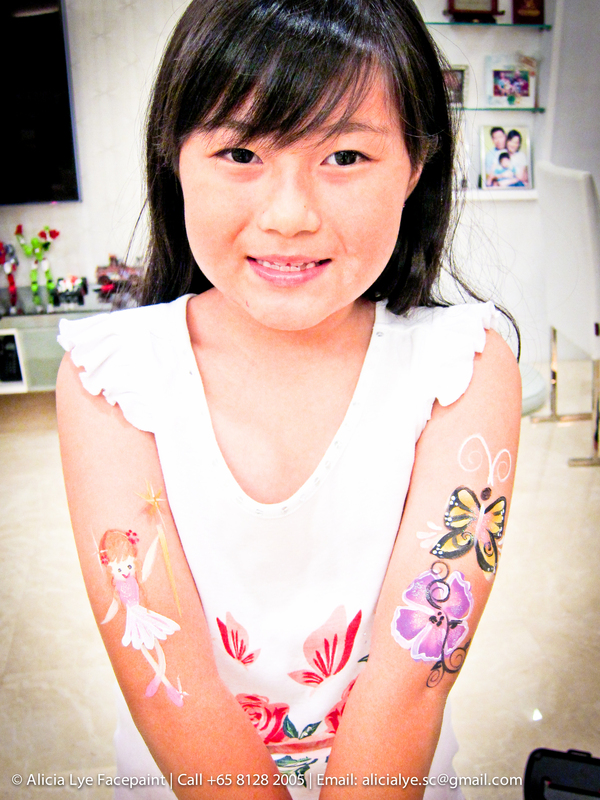 There’s just trying to show you there pretty face painting fairies, flowers and butterflies! 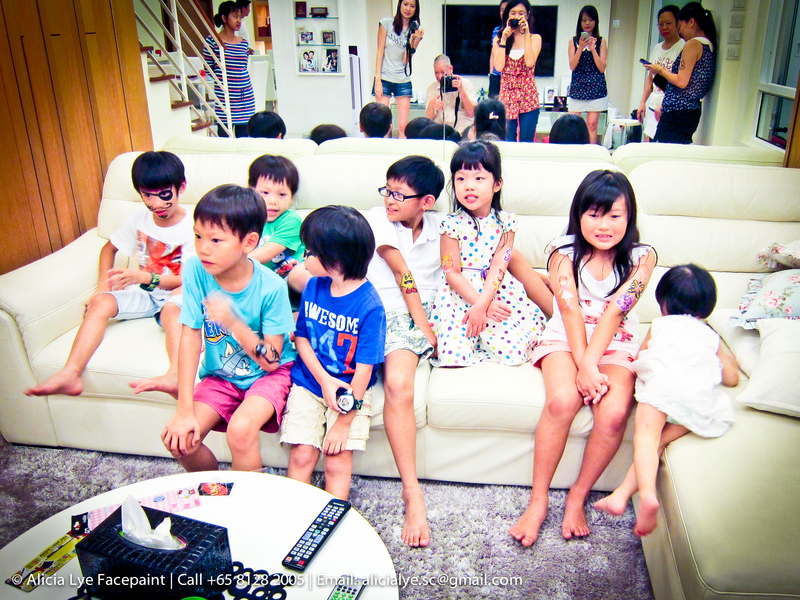 I totally laughed to myself when I saw Baby in this photo. *Pom* Flop down on the pillow. And there she goes rolling herself to safety. Like a commando. Break fall. 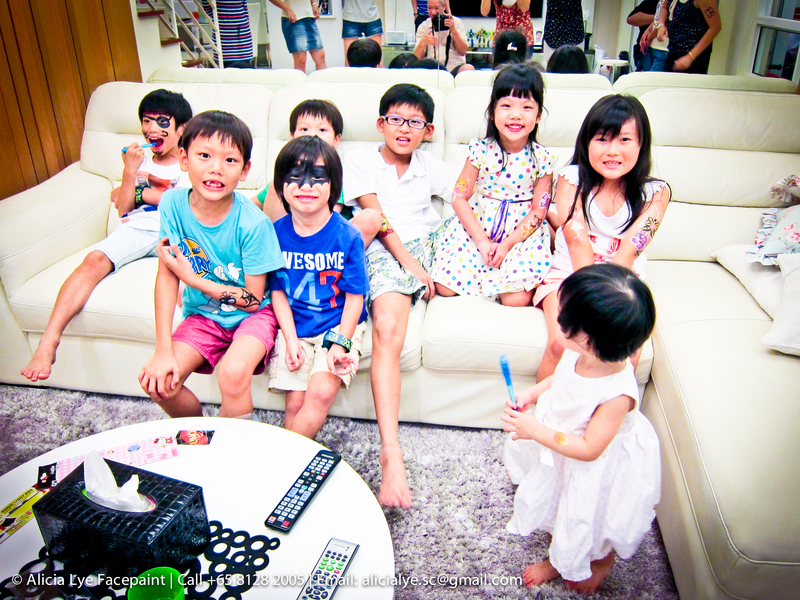 This entry was posted in Events and tagged birthday, boys, entertainment, face paint, face painter, face painting, girls, ideas, kids, party, singapore. Bookmark the permalink.